The world record for configuring this integration is 4.7 seconds. 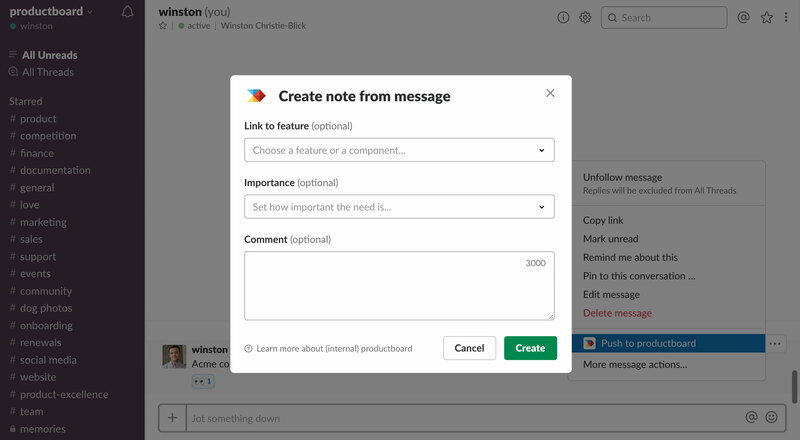 In Slack, hover over a message or threaded reply and select More actions [...], then Push to productboard. Note that you may need to select More message actions... if the option above is nowhere to be found. In Slack, actions are ordered according to frequency of usage. Next you'll have some (optional) options! When a message is pushed to productboard from a public Slack channel, all users will see a view-only confirmation. Change Said by: This field defaults to the person who Slacked the message, but you may want to update it to the relevant customer/stakeholder). Change Owner: This field defaults to the person who pushed the message. Add tags: Add up to three tags. Create new Said by: If you've never attributed feedback to this person before and there's no corresponding record for that person in productboard, you'll need to use this option. Open in productboard: Navigate to the associated note on the Insights board. When it comes to pushing features to productboard, public channels offer the most flexibility. They allow you to push messages as well as threaded replies. They also support confirmation messages that can be displayed inline, right beside the pushed message. We're working with Slack to overcome some of the technical differences in the way private channels and direct messages (DMs) work. Read on for the nitty gritty details. Public channels allow you to push threaded replies in addition to messages. If you push a message that already has threaded replies, they'll automatically appear in the same note. Subsequent replies will need to be pushed manually but productboard will append them to the same note for you. Private channels and DMs don't support pushing threaded replies. Public channels show message push confirmations (with additional configuration options) inline. Everyone will see a view-only confirmation, but only the person who pushed the message/reply will see additional configuration options. Private channels and DMs show message push confirmations (and additional configuration options) in a special productboard app channel and they'll only be visible to the person who pushed the message. It means others won't necessarily be aware you're taking action on their requests, and it won't be as clear for you to see which messages have already been pushed to productboard. 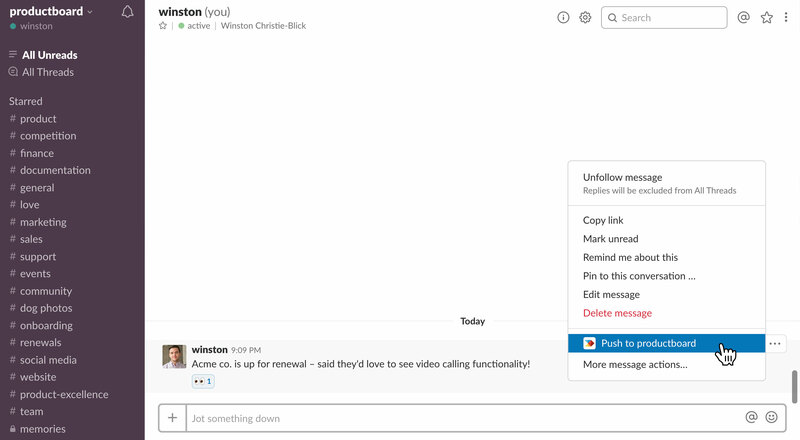 It's not yet possible to create new feature ideas from Slack. You'll need to head to productboard to do that.